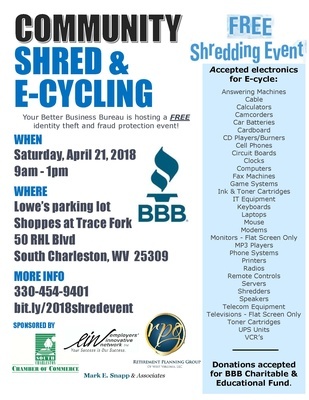 Your Better Business Bureau is hosting an identity theft and fraud event on: Saturday, April 21st from 9am to 1pm. Bring any papers with personal identifying information to be commercially shred onsite. We are also offering E-cycling for electronics (Only Flatscreen TV's will be accepted!). This is a FREE event; however we are accepting donations to our charitable fund to help in offering these events. Please visit our website or call 866-228-1820 for more information.